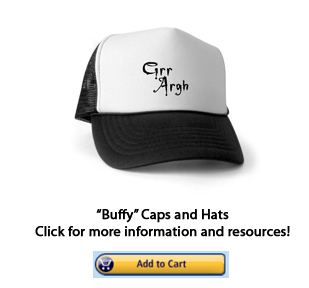 If you are looking for “Buffy” caps and hats but having trouble finding them, then we at BTVS Online are happy to help. We’ve compiled a list of resources for the items made by professional and independent manufacturers who sell the items online and then mail them straight to your home. Hats have become all the rage in popular culture — they’re not just for sports fans and hipsters, anymore! Countless TV shows (like our personal favorite) have inspired artists and other clothing creators to design themed headgear for fans of the programs and movies. “Buffy” is just one example of many! While a lot of the fashion on “Buffy the Vampire Slayer” is not available for purchase (unless you were lucky enough to get the items at the auction soon after the show ended! ), there are still many other related items available. These hats and caps are just some of them. 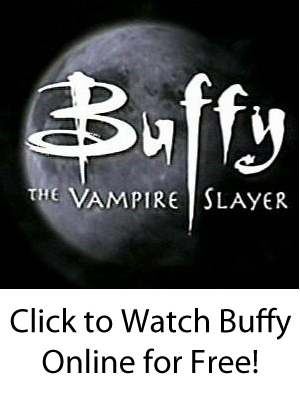 (We have listed more types of “Buffy” merchandise and collectibles as well.) With these items, you’ll be able to show your slayer pride anywhere and everywhere! Below, we have pictured a few of the various “Buffy” hats that are available — whether you are a lawyer who wishes you could work for Wolfram & Hart, a parent who wants to dress up your baby, a die-hard fan who wants to join the club of “Buffy” supporters who think that she should slay Edward from “Twilight,” or anyone else, there is definitely a hat for you. Just click on an image to be taken to the website!